Crack out the streamers, it’s time for a Jackpot Block Party. Powered by WMS, this 5 reel 30 payline game may not be the most visually arresting you’ll come across but it offers a decent range of pick me bonus features. Play from between 30p and £60 per spin. Jackpot Block Party certainly isn’t a thing of beauty as far as design goes – the cakes, dip bowls, lava lamps, glitter balls and gift box images are bright, bold and chunky. The same could be said of the backing track, complete with cheesy voiceover. Subtle this video slot ain’t. The symbol you’re really hoping to see is the Jackpot Block Party logo which is the game’s wild – land 5 of these and you’ll pocket a prize 10,000 times your line bet. 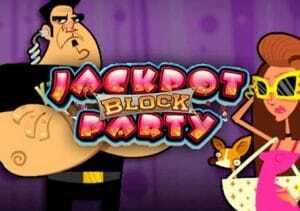 Jackpot Block Party comes with 2 bonus features – both of them are pick me features. Land 3 or more gift box scatters to trigger the Pick a Present feature. This is as straightforward as they come – simply choose 1 of the 3 gift boxes to reveal a cash prize. Trigger with 3 scatters and you’ll win between 1x and 10x your total bet. 4 scatters and between 3x and 10x is on offer. Trigger with a full 5 and your prize will range from 10x up to 100x. Thankfully, the Block Party feature is a little more interesting – to trigger it, you’ll need to land the 3 party scatters on the odd numbered reels. To begin, the screen is split into 4 zones – Players, Office, VIP and Costume with only the Players Party unlocked. Choose gift boxes in the Players Zone to reveal cash prizes – if you find a Plunger symbol, you’ll unlock another zone or better still the Super Plunger which unlocks all other zones. This is where things get interesting. Any gift selected in any open party zone will automatically open corresponding presents in any other opened party zones. For example, pick the prize in the top left corner in the Players Zone and the prizes in the same position in all the other open zones are won too. If all zones are open, you’re picking 4 times with each choice. Prizes of up to 50 times your total bet are on offer in the Private Party. Keep on picking presents until you find multiple Pooper or Buzz Kill symbols. The lack of free spins is a little disappointing and the visuals won’t be winning any awards. Despite that, Jackpot Block Party still has some things going for it, chiefly the Block Party feature which is a novel take on an old favourite. This video slot won’t be for everyone but if you’re after some simple, low variance action then there are worse places to go that this Jackpot Block Party. If you want something more volatile with free spins, WMS Gaming has plenty of options with Nemo’s Voyage a good place to start.